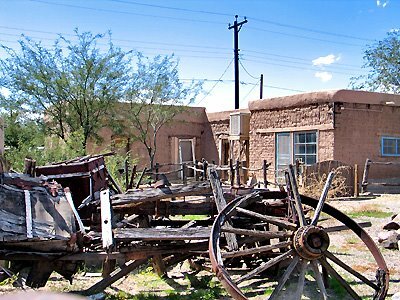 All the early structures in Mesilla were adobe, and many, many adobe structures remain in use. Here’s an adobe house a couple of blocks off the plaza that’s being renovated. 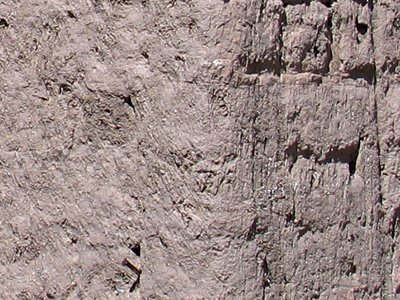 Before the arrival of Spaniards, Native Americans were building using dried mud. But they didn’t use bricks. They built by drying the mud in layers. 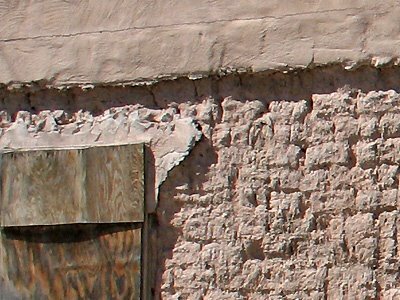 Building with mud bricks was introduced by the Spaniards, and it’s structures built with these bricks which are called adobe. 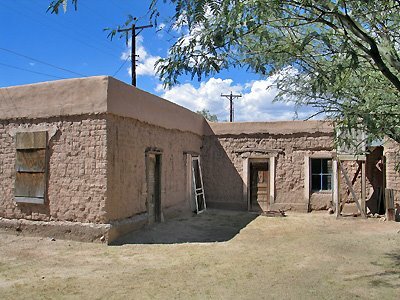 Almost all the early adobe houses are long and narrow, or L-shaped like this one. 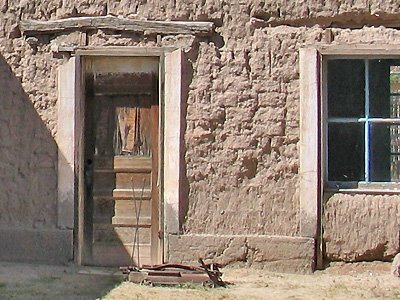 Two features that characterize adobe structures are recessed doors and windows with wooden lintels, as you see here. The recessing is due to the thickness of the walls, which can be two feet or more. The thick walls keep the interior cool in the summer and warm in the winter. Before hard plaster was available, the external and internal surfaces were plastered with mud. Hard plaster is vastly superior, providing a water-proof, durable surface. In this case, it appears that the outside plaster below the top cap has been removed, probably because it was in bad shape. This will certainly be replaced during the renovation.